HE WAS playing international football for the Republic of Ireland in May. And David Forde’s CV makes for impressive reading when assessing the huge amount of League One and Championship appearances he possesses. That’s gladdening for Paul Cook, as he welcomes his keeper to Pompey. But, more importantly, he’s getting a man of real character between the sticks. That’s the key box the Blues manager is ticking when it comes to landing the 36-year-old on a season-long loan. Cook has looked high and low for a man who can handle the pressure which comes with operating between the sticks for Pompey. He is confident that search has reached a fruitful conclusion. ‘He’s a good signing and we’re delighted to get him,’ Cook said. ‘All of our supporters know the boxes we are trying to tick. ‘In David we are not only getting a keeper of international pedigree – we’re also getting a man. ‘It’s something we were searching for all of last season. ‘These keepers have played at higher levels and have been difficult to get. ‘So we are delighted to get someone of David’s quality for the season. ‘David will make mistakes. All keepers will. ‘When Joe Hart made mistakes at the European Championships I text Mark Catlin and said that’s him not coming here now! ‘In my opinion, we have someone who’s not only a top professional but ticks the boxes needed to come to Portsmouth. ‘Fordey is good friends with Neil Harris and when they spoke about it, Neil said “it’s Portsmouth”. ‘We want people at this club who want to play well for this club. Forde represents the ninth summer signing as Cook nears the completion of his rebuilding work. He follows Matt Clarke, Tom Davies, Drew Talbot, Danny Rose, Milan Lalkovic, Carl Baker, Curtis Main and Michael Smith through the door. Noel Hunt remains on trial with the club after leaving Southend. Cook is more than content with the business he has conducted, but is refusing to rule out some more activity yet. He said: ‘We’re almost there and I’m very happy with the squad we’ve put together. ‘There may be a little bit of tinkering and some cover here and there but we’re very pleased. 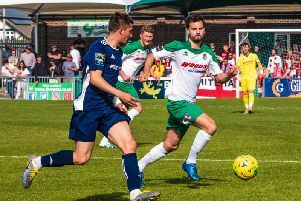 ‘Last year our full-strength team drew at Bognor. ‘This year, what people would perceive as our second string went there and won 4-1. With most of the transfer business completed, attentions are beginning to turn to the League Two curtain-raiser with Carlisle. And Cook is content his players are now where they need to be in terms of fitness after a testing pre-season. He said: ‘They’ve been great. ‘They don’t do a lot wrong in general. ‘Even when they came off at Plymouth, I would have loved to have said we could’ve got more from them. We couldn’t. ‘It’s not just for me and the staff but the players as well. ‘We’ve had all those games and we know what’s coming.